The first main point is that there is no one size fits all, no prescription, pre determined path or one way to do qualitative research. Each project is unique and the flow chart that is provided merely points you in the right direction and indicates where decisions may have to be made. Lancy believes that if you are not willing to engage in a long arduous journey in your research topic, that will include mistakes, at least one major mis-step, and most importantly a lot of uncertainty. Basically, qualitative research is more difficult than quantitative research in Lancy’s opinion. It requires that a person can write well, can live with a fluid project, want a project that is hundreds of pages and you must be able to write in narrative form. It also means hundreds of pages of notes, field notes, transcripts and much more. 1. Finding a problem in the setting. 2. Finding a setting for the problem. 5. Entering the field – you must find a way to illustrate the value of your work to people, stakeholders, subjects and people you will be bothering or affecting during your field work activities. They must feel like it is important or your investigators, participants, etc. may not see enough value to be involved. 6. Data Collection – it is important to do norming, deciding when to take notes, video tape or record audio will all affect that outcome of your data in many different ways. Another important step is to decide when we have enough data. You will always find yourselves constantly referring back to your question in an effort to maintain the proper course. Lancy, D. F. (2001). 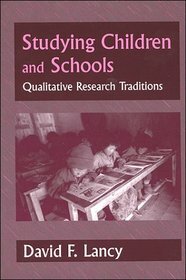 Studying children and schools: Qualitative research traditions. Prospect Heights, Ill: Waveland Press. Executive Summary: The author’s intent is to introduce prospective qualitative researchers [anthropologists] to the broad base of empirical research literature that has yielded important results employing qualitative methods to portray or account for differences in the development and academic achievement of children from cultural, societal, and personal perspectives – within the larger arena of conversations of empirical, educational research on children and schools usually thought to be the sole provenance of quantitative psychologists and sociologists who are using more rigorous, experimental aka “quantitative” research methods for answering their theoretical, “cause-effect” questions. In Chapter 1, Lancy first compares and contrasts the different ways of thinking about and conducting qualitative versus quantitative research studies. He characterizes qualitative studies as naturalistic, context-specific, non-invasive, descriptively-repeatable narratives, captured by observing and discovering phenomenological and subjective realities common to a small sample or group, that are important for the variables, hypotheses or early “natural history” stage of information they provide, either for others who may wish to emulate the particular cases in a similar context, study their generality in other contexts, test the hypotheses that follow from them more experimentally-independent of context. Finally, he notes that the understanding of whether something is or is not qualitative research depends upon whether one is discussing it as 1) a particular method such as the case study approach or a combination or “triangulation” of methods , 2) a particular technique and principal source of data, such as an open-ended interview, non-participatory or participatory observations, or artifacts collected in field work, or 3) a qualitative tradition or paradigm which may define itself as exclusively subjective, such as the phenomenological paradigm. In Chapters 2, 3, 4, 5, and 6 Lancy discusses differences in the traditions and usefulness of qualitative research conducted in the fields of anthropology, sociology and psychology. His goal in Chapter 2 is for the reader to come away with a feel for the accomplishments of qualitative research in education anthropology, with an emphasis on the theme of enculturation in schools as a major vehicle for transmitting cultural beliefs and practices from generation to generation, or as they affect the transitions of one culture into others. He notes that the principal method of anthropologists is ethnography, defined as a description of a particular culture (an historically developed and patterned way of life) of a particular group – an entity or integrated whole that is 1) derived and inferred from descriptions of their beliefs, established inter-relationships between persons and groups, their material goods and technologies, 2) described and documented in sufficient detail so as to be replicable, and yet 3) not sacrificing the validity of an accurate description of the culture in all of its nuances, “somehow [making] the familiar strange,” as in the difference between the web of a garden spider and that of a black widow. In Chapter 3, he notes that the sociological tradition differs from that of anthropology by its concern with how the hierarchical levels of a known society come into being [with a broad base of sociological theories and evidence accounting for them], resulting in an interlocking set of investigative questions that blur distinctions between the qualitative and quantitative research methods that are needed. He elucidates representative examples of important research conducted in order to 1) quantitatively investigate predictions of sociological outcomes made by different models, 2) qualitatively and quantitatively investigate the interactions between multiple factors in producing sociological outcomes, or 3) qualitatively investigate the role that parents, students and teachers play in creating sociological or educational-significant outcomes within particular school settings. In Chapter 4, the author notes that a major qualitative research method used within the field of psychology is ethology – the naturalistic study of certain animal behaviors, those that can be described and portrayed as having a proximal cause or trigger that elicits or releases it, have an identifiable function that evolved to help the animal survive and reproduce, and which develops over time in the life cycle of the animal. Side note: A major limitation of the ethological approach as defined by Lorenz and Tinbergen is its origins from descriptions of the biological function of behaviors that best represent the mostly hard-wired behaviors of animals ranging from ant, termite, or honey-bee colonies to the more reflexive “lower-brain” or easily “programmable” behaviors of imprinting or stimulus-response reinforcement in pigeons, rats, dogs and chimpanzees. It should be noted also that the case study method has been important in the development of Piaget’s theory of the stages of cognitive development in children, and in making cross-case comparisons of successes in school-improvement programs. In Chapter 5, Lancy reviews important qualitative research results stemming from the use of different types of case study methods (single case, cross-case), making the point that case studies have been used more commonly in anthropological traditions, but advocating their greater use in the fields of sociology and educational psychology, along with more quantitative survey or experimental methods, or as evaluative information that may be vital in meeting professional responsibilities, such as altering educational policies, programs, and practices, or affecting school board, teacher, parent, and community decision-making. In Chapter 6, he discusses personal accounts as being different from other types of qualitative research reports in the social sciences because of their phenomenological focus on a specific person’s personal life, views, or accomplishments, rather than for their generality as cases across persons, or as an instantiation of a more general conclusion or expected outcome. 1. When a problem has been identified, the research must select a suitable tool or method to investigate it. Under what circumstances would it be appropriate to choose qualitative methods and how does this relate to your area of interest? 2. Some argue that there is significant difference between qualitative and quantitative data. After all, qualitative data typically consists of words while quantitative data consists of numbers. But, if all qualitative data can be coded as numbers, are they really all that different? No matter your answer, please explain why or how you arrived at that conclusion. 3. How does understanding human behavior relate to qualitative research? 4. What type of research question would best be answered through a case study approach? 5. Why study personal accounts? Why would one want to review such a body of literature in the first place? How should one go about conducting an analysis and synthesis of personal accounts? Each qualitative research project is unique and the decisions that are made throughout the process direct the path that it follows. A. Why are we doing research? 1) If you uncomfortable with any degree of uncertainty → do quantitative research. B. Which qualitative research tradition do you want to follow? 1) By following a research tradition, you’ll know what to call it and how to talk about it. A. Negotiate entry and obtain tentative agreement. 1) The nature of the phenomenon will suggest a broader topic or issue. B. Refine the selection of your tradition. C. Start with a setting (usually where anthropologists begin). A. Review literature on the topic, setting, and research design; it is an ongoing process. B. Begin an annotated bibliography as soon as possible. C. Seek out technical reports. D. Write to the authors for more information. E. Attend training on specific areas of methodology. A. Develop a preliminary proposal that includes reason for the study (rationale) and problem statement, background, and method and plan for data analysis. B. Submit to the IRB, committee members, funding sources for constructive feedback. When will it start and end? What is the unit of analysis? How many of these units will be studied? What will be the role of the investigator? What will be the principal sources of data? How will these sources be used? How much data will be collected? How will they be analyzed? D. Cite a similar study to provide a partial rationale for you decisions. E. Leave loopholes in the proposal in order to account for necessary changes. F. Show mastery of your topic by providing a lengthy literature review that cites critical pieces of literature. A. Do not need to show that research has a direct benefit to participants. B. Argue that it will benefit the researcher as well as contribute to solving a particular problem. You can get permission to be an observer, but you must be invited to become a participant. D. Do not do research where you are an insider. B. Choose your method for data collection (i.e., videotaping, taking notes). C. Refer back to your problem statement and literature review. D. Include critical details (person, place, activity, date, class period) in your observation. E. Take different kinds of notes (general description, detailed description, or explanatory description). F. Interview multiple informants, include casual conversations, start with longer exploratory interviews and move towards to shorter confirmatory interviews. G. Involve the collection of artifacts. H. Decide when you have enough data. A. Reassess your focus, methods, and purposes once data has been collected. B. Continue to work on annotated bibliography. C. Develop a theory or model to explain your findings. D. Seek patterns in your data and begin preliminary analysis. A. Analyze and reduce what has been collected. B. Identify major themes or develop coding form. C. Look at published literature to gauge how much to reduce. D. Prepare a preliminary report. A. Structure your report on natural divisions based on major themes. B. Return to the model study for guidance. C. Avoid writer’s block by starting on your methods section or lit review. D. Share your draft of the final report with others. E. Be prepared if informants are disappointed in report. F. Select carefully your committee chair because he/she will need to referee any disagreements. G. Join organizations in order to get your research published. The summary for Lancy ch 1-6 is located at the following link or in our Dropbox under Lancy. Question 1: The research investigator conducting a qualitative study can serve as an interviewer or? Question/Activity 2 and 3: Fill in the “Double Bubble Thinking Map” below to compare/contrast qualitative and quantitative analyses. Which approach leads to more detailed and valid data? Why? Question 3: Among the enculturation studies in chapter 2, which study stands out the most to you and why? Question 4L how has America’s school culture changed the last decade? Question 5: How are sociological tenets or beliefs different or the same as anthropological tenets or beliefs in America’s schools? Question 6: What is wrong with the rough and tumble methodology? Question 7: Case studies allow investigators to generalize, but not “overgeneralize.” Why is this so? Question 8: What can we learn by collecting the personal accounts of teachers who have taught within the last 50 years? Would this info help reform educational policies? What, When or How is Ethnography?